My good Doubledog Dare stamping buddy, Anne (Itsapassion), was the hostess for the Inspiration Challenge over on Split Coast today and she asked me, along with some other of the DDC team, to make a card for her to link to the challenge as an example. 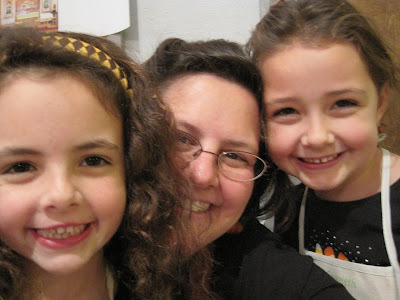 She showed us a wonderful web store of beautiful ceramic creations. 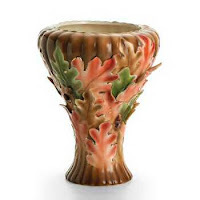 Since I love bringing flowers from my garden into the house, I took a look at the vases and found this pretty leafy one, perfect inspiration for this fall season! And here is my inspired card. 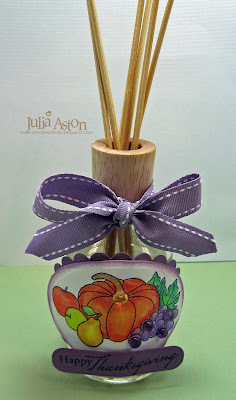 I used a woodgrain designer paper from Dream Street Papers for the background to mimic the look of the vase. I embossed it with the Distressed Stripes Cuttlebug folder but I don't think you can see that in the picture. It adds a little dimension IRL! I stamped the label, cut it out with my Labels Four Nestability and then cut out the center with my Petite Oval Nestability. I stamped the sentiment on the oval and adhered it right onto the DP. I layered the frame over the sentiment with foam dimensionals. I stamped a bunch of the leaves with several colors of ink, using the rock and roll technique on some of them (ink the stamp with one color, then rock and roll the edges on another color). I bent each leaf a little and attached them over the frame with foam dimensionals - adding a vintage wood button knotted with twine to the centers. I rounded the corners and knotted the ribbon around the bottom edge. I was really pleased with how this came out! The stamps I used are all from Waltzingmouse. The label/frame is part of the Very Vintage Labels #4 set (this set is presently sold out but Claire is keeping a wait list so get yourself on it!) and the leaves and sentiment are from the Blessed by You set. 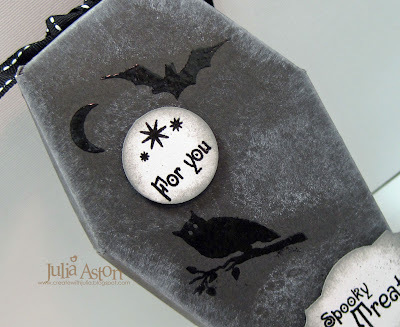 Check out Claire's blog - she's doing sneek peaks for her soon to be released new stamp sets - and one of them is a secret set you'll need a password to get to see - how mysterious!!!!??? what's that all about??? We are going to my husband's brother's in Vermont for Thanksgiving this year and I wanted to bring along some thank you gifts. 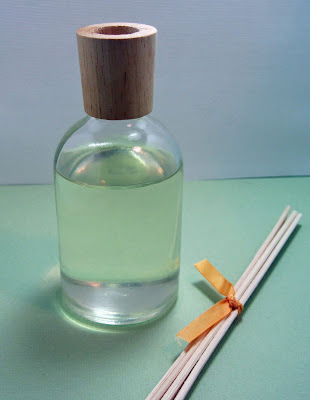 I bought this plain glass bottle Warm Apple Pie Fragrance Diffuser thinking that I would decorate it somehow. Today's Ways to Use It challenge on Split Coast was to use purple on a project and the Moxie Fab World challenge this week is to Capture the Essence of Plum so these two challenges were my inspiration for my decorating colors. I colored this wonderful fruit image by Waltzingmouse Stamps with Prismacolor Watercolor Pencils and Gamsol, cut it with an oval Nestability and layered it to a scalloped oval Nestability. I wrapped a band of dotted designer paper around the bottle that I punched with an EK Success scalloped lacey punch. I layered a piece of Plum Pudding satin ribbon over the band. I tied a piece of Plum Pudding saddle stitched ribbon arond the neck of the bottle. 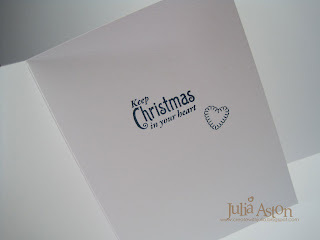 The sentiment, also from the Peace & Plenty Waltzingmouse set, is punched with a Labels Trio Spellbinders die. To give the image a little dimension - I attached a few dew drops to the grapes and the pumpkin. I think this will look quite decorative on a side table for the Thanksgiving season don't you? ..... and it smells like apple pie - what more could you want!?! Accessories: sponge, Prismacolor Watercolor Pencils, Gamsol, oval & Scalloped oval nestabilities, tag trio Spellbinders, Satin & Saddlestitched Plum Pudding Ribbon - PTI, scalloped EK Success punch, scor tape, dew drops, foam dimensionals, glue dots, Frangrance Diffuser. 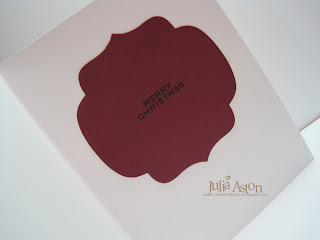 I made these Christmas cards for the October Papertrey Guest Stamper challenge to make a Clean and Simple Holiday card. This card is simply a panel of card stock, a 2/3rd's panel of designer paper, a ribbon tied along the edge with the sentiment stamped directly on the cardstock - accented with one dew drop and corners rounded! Accessories: Dew drop, glue dot, Scarlet Jewell extra fine polka dot satin ribbon- PTI, corner rounder. 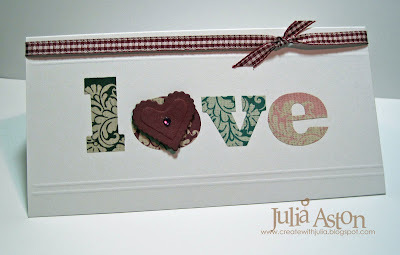 And here is a no layer card where I just stamped the damask and greeting right on the cardstock. 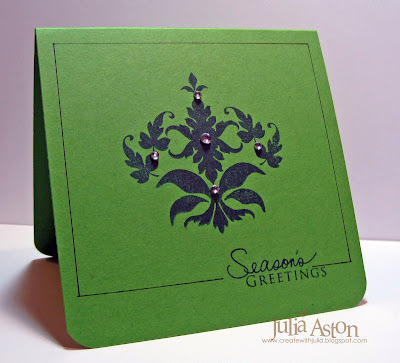 I accented the damask with a few gems and outlined the card with a black Micron pen! It would be easy to make lot's of these cards in no time at all! I made this 6x6 page for Week 20 of the His Holy Name Challenges on Split Coast - God's attribute for this week was Bread of Life. I chose John 6:35 to illustrate this attribute that I printed on the computer and cut with the Labels Three Nestability. I used the MojoMonday sketch from last week. 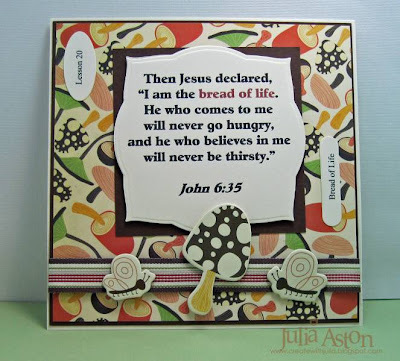 I liked the earthiness of the Cosmo Cricket papers and chipboard pieces and thought they accented the idea of Jesus being one of the basic things in life we need to survive. 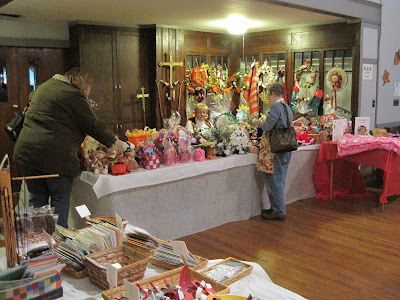 Gosh - I had such a busy weekend - our church fair was Fri and Sat (see pics at end of this post!) - then DH and I went to a coffee house to see two Irish singers Sat night, and then I had church this morning - BUT of course, I still had to stamp! So here are two projects I did combining several challenges this weekend. The featured stamper today was Rachelhope13 - I had not been in her gallery before so it was fun checking out all her cards! I finally chose this plaid stocking card to case. I used a different stamp, made my own plaid background panel with stamps, tilted the image panel and lowered the ribbon! For my ribbon - I used the buttony bow technique that Joanne created . She is offering a chance to win blog candy if you link a card using this technique - you can see her video tutorial here ETA: Joanne picked my card as one of her 10 favs! I distressed around all the edges and sponged them with So Saffron ink. I layered the stocking image - first stamping it on the white panel - then on scarlet and two different designer papers - cutting out pieces and layering them over each other using foam dimensionals. My second project is actually a 6x6 page that I made for the His Holy Name challenges that I do every other Sunday. See my side bar for a link. You can find Patter's challenges here in the SCS forums God's attribute for week 19 was The Word. 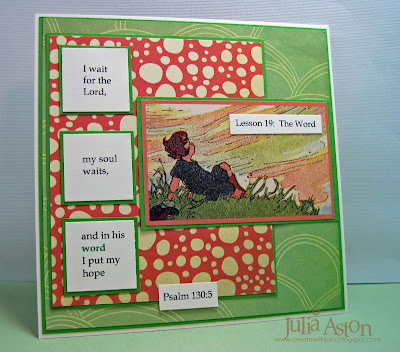 I chose Psalm 130:5 to illustrate the word for my page today. I thought this image block from Cosmo Cricket Earth Love designer paper fit it beautifully. I can just feel God's breezes swirling around this girl - waiting for the Lord on this hilllside - can't you?? 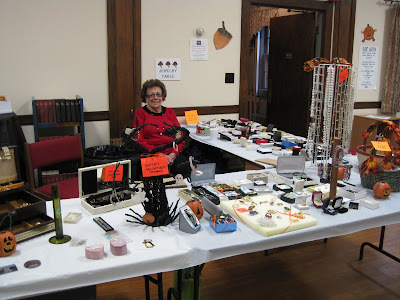 And finally - here are some pics from our church fair - we had a full house crowd on Friday night and I forgot to take pictures we were so busy! So these were taken Saturday morning just as we opened - we didn't have as big a crowd on Saturday but there was a steady trickle of people luckily! 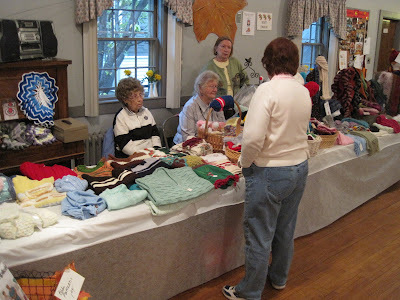 Here are Lillian, Dot and Sandy - displaying all the wonderful hand knit items people donate for us to sell. 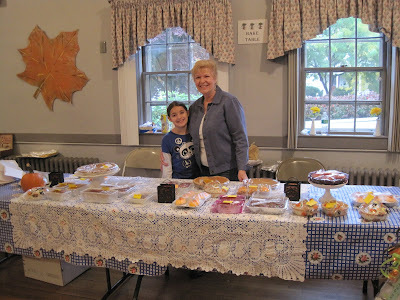 Here's Cathy and her granddaughter - selling what's left on the Home Backed Goods table. You couldn't even see the tablecloth on Friday night! Some of the ladies put together various themed baskets (kids, wine, bath and body, etc) for a raffle. Here's Linda ready to sell tickets! 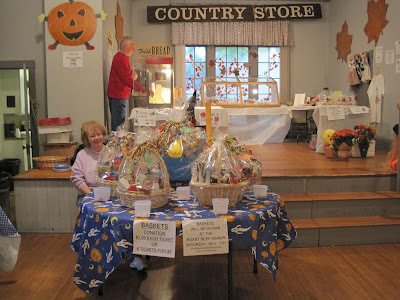 Our Country Store table is in the background - here we sell bakery bread, home made baked beans, corn chowder, fresh popped pop corn, canned jellies, relishes and Apple Cider. 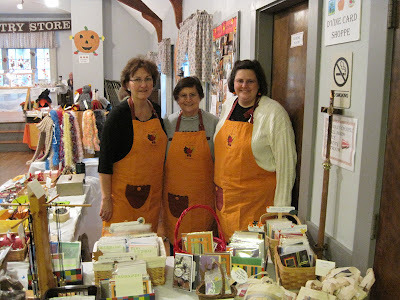 Here's me, Jeannine, and Elizabeth at our D'Vine Cards Table - where we sell hand stamped cards and crafts. Jeannine got us these cute autumn aprons at Joanne's for us to wear. We are all a little exhausted! Dale and her daughter and friend Peggy make holiday gifts/decorations all year long to sell at this packed table! 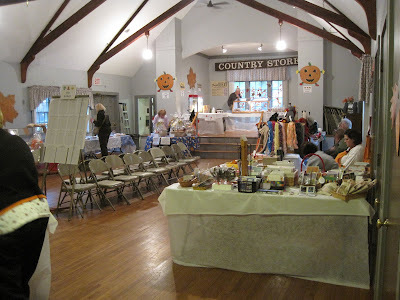 Here's a shot of the main hall - we also have a sncak bar and Attic Treasures room downstairs. And here's Jane selling what's left at the jewelry table - The crowds flock to this table first on Friday night - hoping to find that million dollar gem that someone gave away not realizing the value of it!!! And finally - here are 6 year old twins, Paige and Gweneth with mum, Elizabeth. They were a great help to us at our card table - putting sales in the bags and giving out change - they love to stamp too! I didn't know that Elizabeth snapped this picture with my camera - I found it when I down loaded the others - It was a fun surprise - as well as a great picture!! If you are still here reading this (!!!! ) ... thanks for sticking with me through this long posting!!! 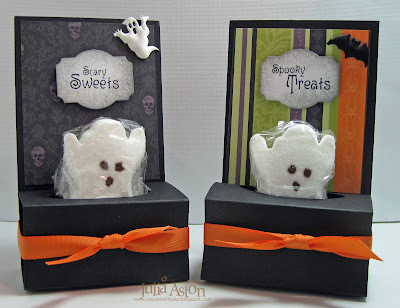 Ghostie Peep Treat Box & a Skull Jar ! Ok, so I lied - I'm not quite done with Halloween projects! My church fair is this weekend and I've been madly making little last minute crafts after work to sell at our stamping table where two friends and I (Hi - Elizabeth and Jeannine!) make cards and stamped crafts to sell. 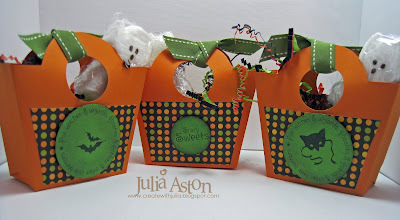 The sentiments I used on these spooky treat boxes are from the Halloween Party stamp set by Waltzingmouse Stamps. I punched them with the Designer Label punch by SU. These fun little box/stands are designed by Ana Wohlfahart but I think her scoring measurements were a bit off on her instructions. Here is how I made mine: Basically the box is a 3" x 11" piece of cardstock. I scored along the 11" side at 1 1/2", 3", 4 1/2", 6" and then cut an oval (smallest petite oval nestability) on the section between the 1 1/2" and 3" score (2nd panel in). Next fold on all score lines, fold up the box part and adhere it with Scor tape to the back panel. Cut a piece of designer paper for the back panel - decorate as desired. I tied a ribbon around the base and sponged a little white ink around it. Here's my little army of ghosts! I wrapped up the ghost Peeps individually in Saran Wrap and placed them inside the oval cutouts- I think they look so cute peeking out here! I adhered some fabric bats, ghosts and pumpkins in the corners - they were left over from the supply Joanne (sleepyinseattle) had given the Doubledog Dare challenge team this week to use to make a Halloween card. 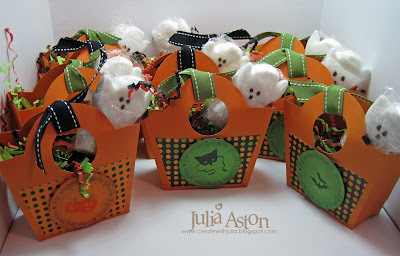 So here's my little bucket of 12 treats ready to go home to some little trick or treater for Halloween - don't they look spooky/cute!?! I made these cute jars the night before the fair - I just happened to stop into Michael's and they had this Martha Stewart Skull punch on sale ($9.99 marked down from $17.99!) So I brought it into my craft room and saw these 5 little jars sitting on the floor - left over from an Easter project last spring! 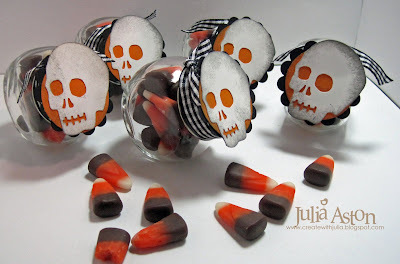 I just happened to also have a bag of this chocolate candy corn and the whole design came to mind. Here's a close up of the front view. I sponged the skull with Smokey Shadow Ink. 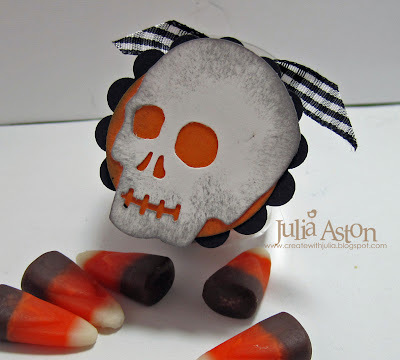 After I punched the skull, I realized that I needed something behind the eyes and mouth to make them stand out - so I punched an orange circle - then the base needed to be bigger to cover the jar top - so I tried the scalloped edge circle with black card stock. Then I just had to cover the rim with a coordinating ribbon and fill the jar with the candy! Another cute little treat! 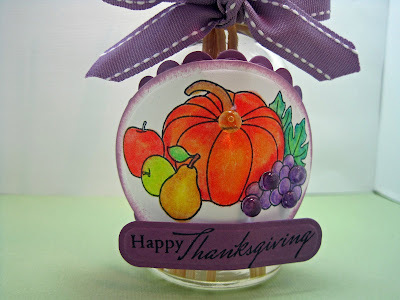 This week Dancerriley was the Featured Stamper over on Split Coast Stampers. I chose her pretty ornament card to case. I used a a different ornament stamp, different colors and a different nestability cut out - but the theme is basically the same. The stamps I used are from the new Sewing Box Christmas (the ornaments) and Seasons of Love (the sentiments) stamp sets by Waltzingmouse Stamps . Both sets offer lots of possibilities for all your holiday card needs! 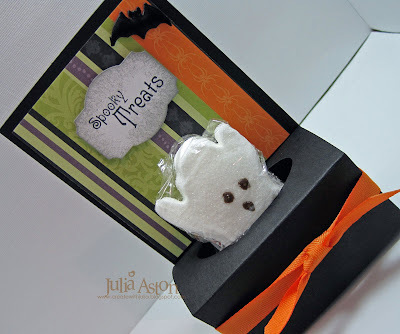 You can check out Claire's wonderful samples on her blog. For the ornaments - I stamped them first on avocado card stock and then again on designer papers. I cut out the center part from the DP's and layered them over the avocado stampings using foam dimensionals. I punched a hole for the loop and threaded gold ribbons through as hangers attaching the ends on the back of the panel. I slipped wider gold mesh ribbon under the hangers tying it in a knot on the side. For the sentiment inside the card - I adhered the center piece that was left from cutting the Labels Nine Nestability frame on the front of the card under the ornaments and stamped Merry Christmas directly on the Nestie cut out. Caseing a card for the Featured Stamper challenge is so fun - I would not usually use so many patterns or have created such a busy card on my own - these kinds of challenges make you move out of your comfort zone and grow a little in your creating! My church fair is this weekend (Fri and Sat) and I'll be selling at it both days as well as helping close it down on Sat afternoon - I'll have some pics to share with you after the weekend! 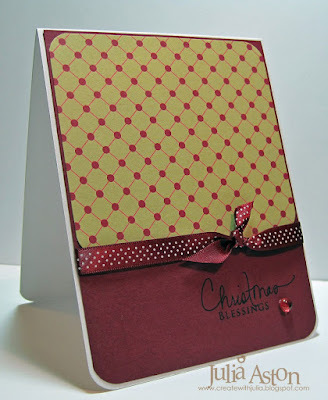 This card combines two Split Coast Challenges - the clean and simple challenge to make a sympathy card and the color challenge - to use burgandy, coral and vanilla. My card is 4 1/4 x 4 1/4 and it went together pretty quickly - which is the goal of a clean and simple card, right?! I stamped the label - cut it with a Labels Four Nestability (that fits it perfectly!) stamped the sentiment inside the oval and layered it onto a piece of designer paper using foam dimensionals. Then I just added the pretty Prima flower with a glue dot. Easy peasy! The frame stamp is from a set called Very Vintage Labels 4 from Waltzingmouse Stamps (it's presetently sold out but Claire is putting names on a waiting list ) and the lovely sentiment is from a set called Blessed by You - check out all the great sentiments and images on this set! The black panel is cut with an inverted scalloped square Nestability - the sentiment, ghost and witch are all up on foam dimensionals. This is another 4 1/4 x 4 1/4 size card. (I love this little square size!) and I had the ghost's tail stick off the side a little bit so it really looks like he's flying in front of the card! We'd love to have you join us by making a Halloween card too! - just put DDC in the keywords when you load your card onto Splitcoast! The Limited Supplies challenge on Split Coast a while ago was to use a Christmas tree on your card. I tried to keep the supplies limited but I was also doing Taylor's sketch for that week on this card so it ended up with more than a few layers! I used a circle and pinking circle nestability to frame my image and two Cuttblebug folders, the snowflake and Swiss Dots. The sentiment by Rubber Soul was punched with the Word Window punch from SU. 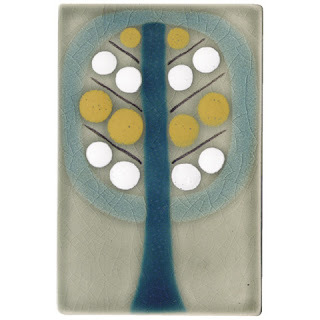 This is a picture of the pretty tile from the Xenia Taler web store that inspired my card for Saturday's Inspiration Challenge over on Split Coast. 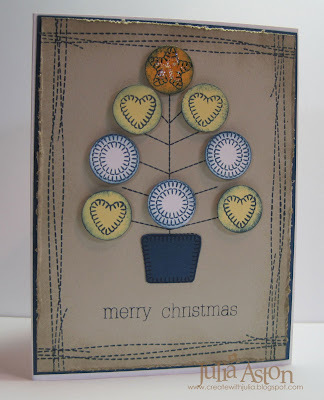 It instantly made me think of this fun tree stamp from the new Sewing Box Christmas set by Waltzingmouse Stamps. If you are into folk art and/or sewing or just that home spun look - this is the set for you! I stamped the 'ornaments' on colored card stock, punched them with a circle punch - then layered them on the tree with foam dimensionals after sponging the edges. I paperpieced the base with card stock. The Faux stitched border is from another Waltzingmouse Stamp set called Off Beat Backgrounds (check out the fun stamps in that set!) I distressed the edges of the top panel and used some silver ice stickles on the star for a little spot of shimmer. Inside my card I stamped a pretty sentiment from the Seasons of Love set as well as the stitched heart from the Sewing Box Christmas set. I may go back and color that in yellow to match the front of the card now that I'm looking at it here!! I wanted to share another craft I made to sell at my church fair. 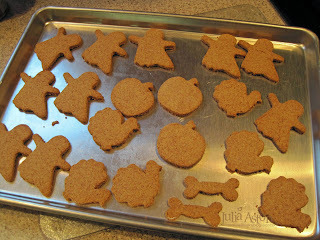 I made some more dog cookies - this time in the shapes of ghosts, pumpkins and turkeys for the up coming holidays! You can see my other dog bones on this post. 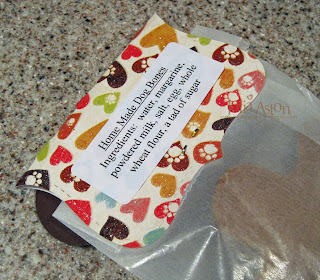 I placed two cookies in each bag - some went in clear cellophane bags (Michaels) and some into wax paperbags (Papertrey Ink). I cut toppers from DCWV The Pets Stack using the Top Note die from SU and folding it in half over the top of the bag. 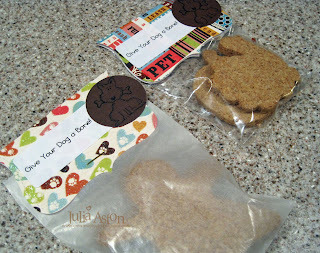 You can find lots of dog bisquit recipes here. I made the Milk Bone ones. I stamped a little dog with a bone in his mouth (Stamp Craft) on brown card stock and punched it with a circle punch. I printed labels on the computer that say "Give Your Dog a Bone" and stuck them on the front. I know people like to know what they are giving their pets so I printed a list of the ingredients on a label and placed it on the back of the bag topper. 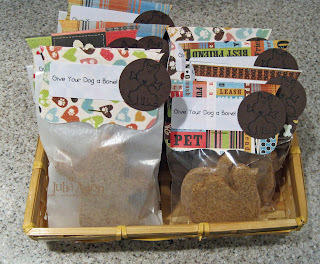 And here is my little basket full of the dog cookie bags - ready for the sale! And finally I have a card to show you - We had a fun Ways to use it challenge over on Split Coast a while ago entitled "Say it with Pizaaz'. We were to JAZZ up our sentiments! I used some Damask Sticky Alpha letters by ColorBok that I got recently on sale at Michael's for my JAZZED up sentiment. I added an embossed scalloped heart Nestability with a gem over the letter O, scored some lines above and below with my Scor Pal and added a thin gingham bow! 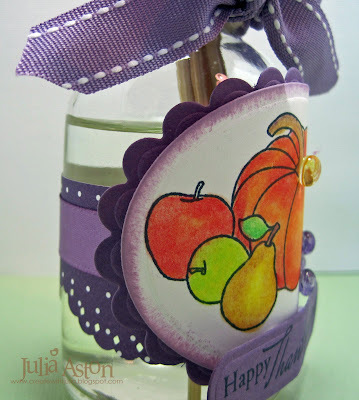 A clean and simple card with pizzazz!! 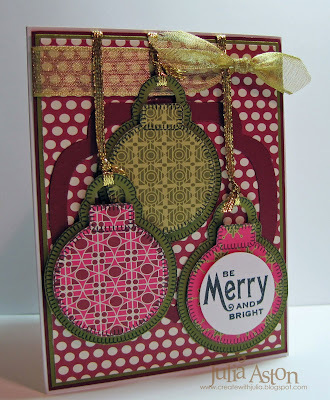 I wanted to share some projects with you that I used the pretty new Waltzingmouse Stamp set called Sewing Box Christmas. These images have such a wonderful homespun look with their 'stitched' edges. My little totes are made using the Ready Set Wrap Templates from PTI. I used the holly image on the large tote - it matched so well with this pretty Cosmo Cricket designer paper Jolly by Golly/Merry Berry. I just stamped the holly, cut it out, adhered it to the side with foam dimensionals and added a button as a berry. I stamped the sentiment and cut it using a Tag Trio Spellbinder die and adhered that with foam dimensionals also. I sponged the edges of the tote handles with Aqua Mist Ink and tied a knot in the ribbon through the handle. I placed 5 wrapped mints inside for the lucky receiver! For my little tote - I stamped one of the little snow flakes from the set twice on each side and sponged the edges with ink. I stamped the sentiment (actually separate words) on red and punched with a circle and adhered it to the front. I used my Martha Stewart punch for the snowflake - added a button to the center and adhered it with a foam dimensional. Just two mints fit inside this mini tote! 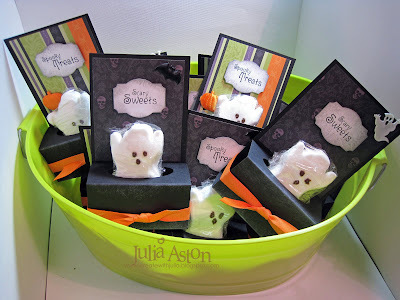 I made 6 of each size of these cute treat holders - another item to sell at my Church Fair that's coming up on 10/24. Paper: Riding Hood Red, Sage Shadow: SU, Vintage Cream: PTI, Cosmo Cricket Jolly by Golly/Merry Berry & Oh Joy Frosty. For my card, I used the snowflake image from the set as well as three of the separate words among many in this lovely set. I just stamped them right onto the designer paper here and added dew drops around them. I used Taylored Expressions Sketch for my card design. I stamped the snowflake twice, colored one of them with my Copic G21, cut out the inside part of the uncolored one and layered it onto the first stamping with foam dimensionals. 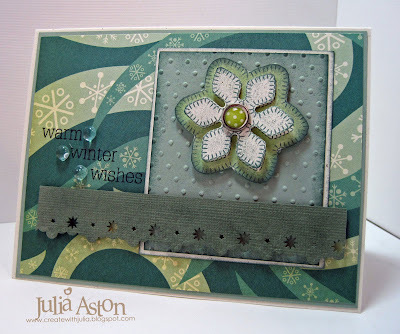 I embossed the green panel with the Swiss dots Cuttlebug folder and sponged all the edges with Ocean Tides Ink. The snowflake punched edge is a Martha Stewart punch. I hope you've enjoyed seeing some of the stamps in this pretty set! Thanks so much for stopping by! I was so excited to try another easel card for the Try a New Technique challenge over on Split Coast this week. 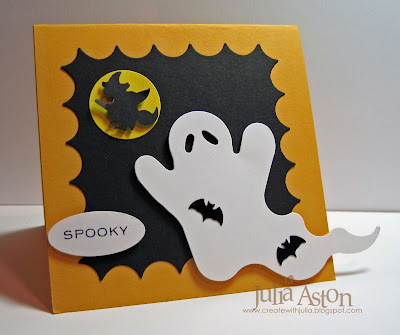 I just love this style card - you can see a Halloween one I made and my tutorial for making one on my posting here. They are so easy to make and look so stunning don't you think?? I made mine a 4x4 this time (base 8x4, front 4x4). The stamps are a new set called Peace and Plenty by Waltzingmouse Stamps . 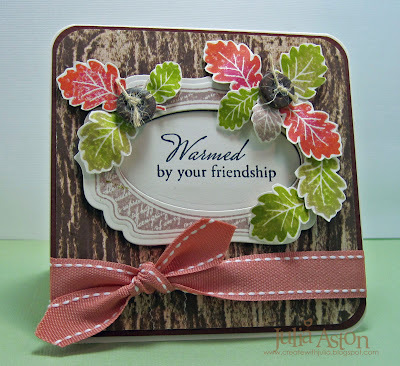 I just love the mixed fonts on the sentiments in this set and all the lovely fall images. 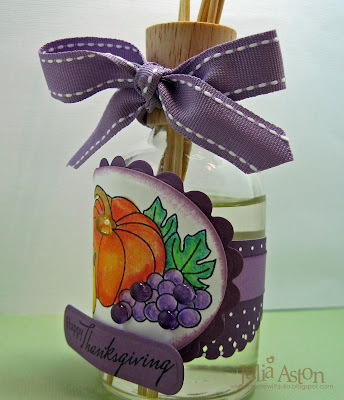 I used Spellbinders Fancy tags for the sentiment and Labels Nine for the image. I added some Dazzling Diamonds to the leaves and acorn tops for a little sparkle. I think you can just see a little of the sparkle on the first picture - it's really shimmery IRL! As always I am thankful that you came by to visit me! Yikes! doesn't this look like it's straight out of a scary movie!??! 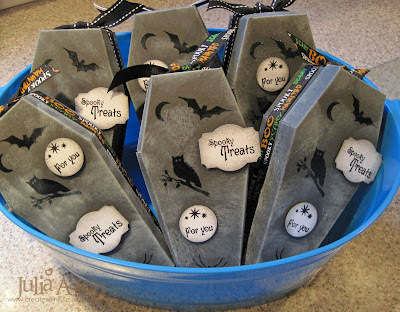 I just LOVE this little coffin treat box and had to whip some up to sell at our church fair coming up in a couple of weeks. The template comes from Martha Stewart Magazine but I found the link and template on Split Coast from Stampztoomuch in the forums under Templates. 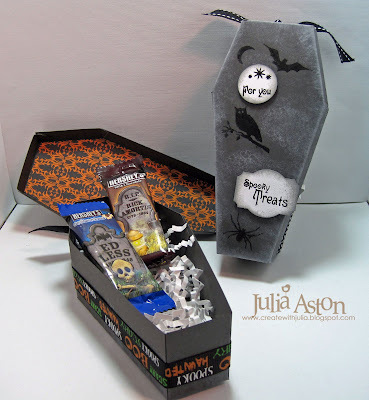 This is also my challenge for the Doubledog Dare Challenge ladies over on SCS as I am the hostess this week - the challenge - to make a coffin treat box! I can't wait to see the different ways people decorate these! I printed the template right onto my Smokey Shadow cardstock so it was really fast to put it all together. 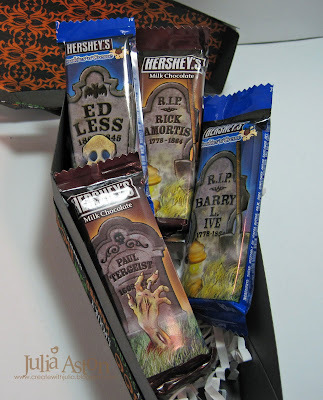 I found these perfect treat size Hershey bars at CVS to tuck inside with some basket shred - they actually have tombstones on them (even on the chocolates when you open them! How do I know that???!!) The directions say to create a complete lining with designer paper (SU) but I just lined the inside of the cover. I try to keep things simple when making a bunch of anything! 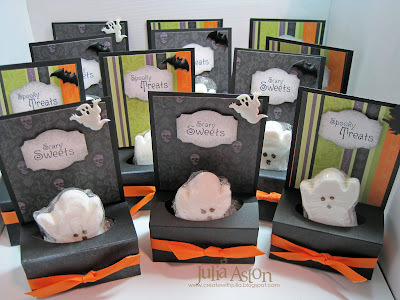 I used lots of images from the Halloween Party set by Waltzingmouse Stamps - embossing them with black embossing powder. Then I sponged around the images with Fresh Snow ink. 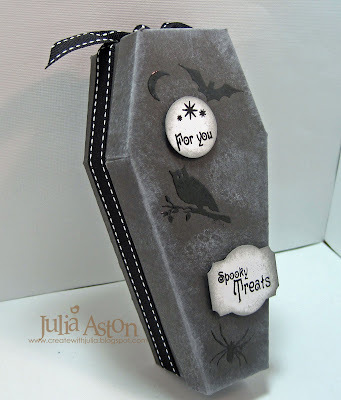 The sentiments are black embossed, then punched and the edges are sponged with Smokey Shadow ink and adhered to the casket with foam dimensionals. Then I just wrapped 23" of ribbon around the base and knotted it at the top. To make the inside cover lining I printed the template on white computer paper, cut out the inside of the top and traced it on the designer paper. Here you can see some of the creative names they put on the candy bars - Paul Tergeist, Ed Less, Rick Amortis, Barry L. Ive - pretty clever huh! 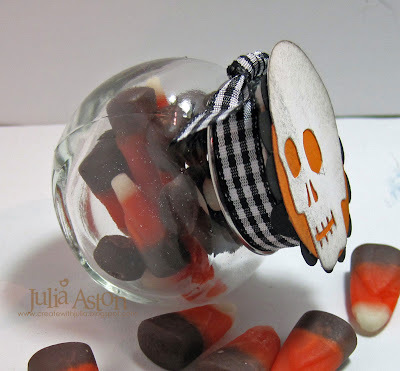 So much more fun to find inside these than just plain old candies! So here is my bucket of six caskets! I usually do 6-10 of each thing I make to sell at our church fair - two friends and I have a stamping table - call D-vine Designs (it's a Harvest Theme Fair)and we sell stamped cards and crafts so every September I'm working like crazy to get things made to sell! 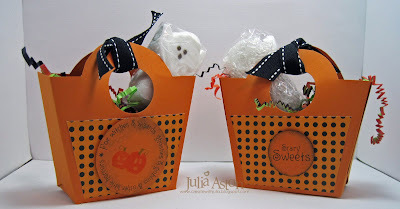 I just tucked a cellophane wrapped little ghost Peep into each one of these little purse bags along with some Halloween colors basket shred (I added a little candy bar to each bag after I took these pics as the ghosts looked a little lonely!) The two end ones are the fronts - the middle one is how the backs look - it says Scary Sweets. And here is the whole group of little treats! Hopefully they will all be sold very soon!! Thanks for stopping by today! Link back here if you make any of the coffins so I can come see them ok!?!?! A Box of Wee Gingerbread People!